The GNU Arm Embedded toolchains are integrated and validated packages featuring the Arm Embedded GCC compiler, libraries and other GNU tools necessary for bare-metal software development on devices based on the Arm Cortex-M and Cortex-R processors. The tool chains includes the (cross) compiler, binutils, debugger and more! Visit the download page and download the tool chain archive. Extract the archive to a directory of your choosing and remember the path. For the purposes of the notes on this page we will assume it has been extracted to the user-local directory ~/gcc-arm-none. We will need to tell Eclipse where we extracted the toolchain to later. 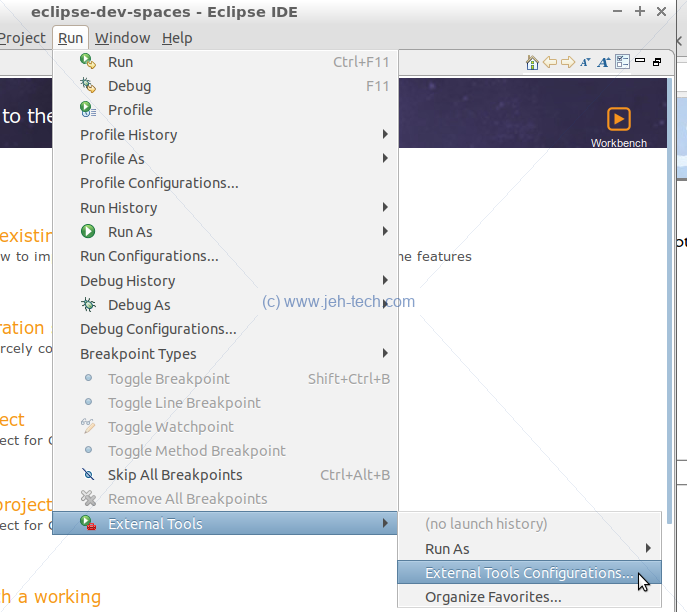 The Eclipse C/C++ Development Tools (CDT) run on the eclipse platform and add extra functionality that will help with developing C/C++ applications, including things like syntax highlighting and code indexing. The CDT Project provides a fully functional C and C++ Integrated Development Environment based on the Eclipse platform. Features include: support for project creation and managed build for various toolchains, standard make build, source navigation, various source knowledge tools, such as type hierarchy, call graph, include browser, macro definition browser, code editor with syntax highlighting, folding and hyperlink navigation, source code refactoring and code generation, visual debugging tools, including memory, registers, and disassembly viewers. In the window that pops up click on the Manage button. You will return to the previous "Available Software" window. Drop the "work with" list down and select CDT as shown. Select "CDT Main Features" and click Next. Click next through the remain screens accepting an license conditions. At this point you must now restart Eclipse if not prompted to do so. 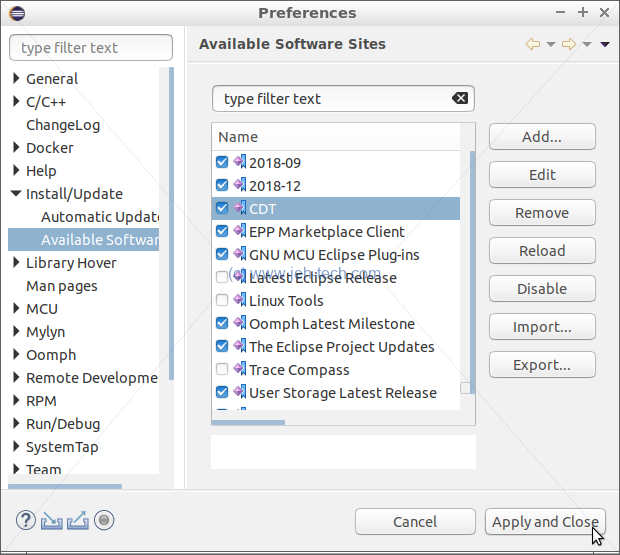 This plugin extends the CDT plugin installed in the previous seciton by providing a mechanism with which to use the GNU toolchain, which you installed in the first section, through the Eclipse GUI. 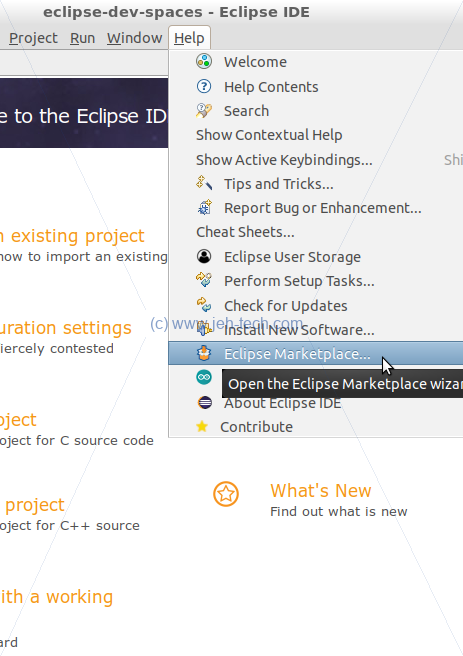 From the main Eclipse menu select Help > Eclipse Marketplace. 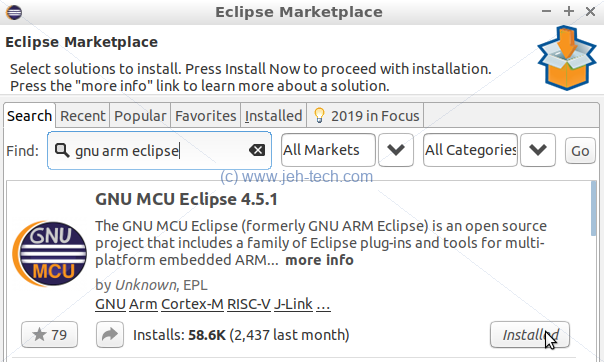 In the pop-up window that appears type "gnu arm eclipse" in the "Find" textbox and click on Go to kick off the search. The first entry found should be as shown, "GNU MCU Eclipse a.b.c". Click on install and follows the steps. Once Eclipse has restarted, from the main window's menu select Help > Install New Software. In the resulting window select to work with "GNU MCE Eclipse. Select "GNU ARM & RISC c/c++ Cross Development TOols" and clicj Next, clicking through the installation screens and accepting agreements. Included on the devlopment boards I've been playing with is the ST-LINK in-ciruit debugger and programmer. To use take advantage of this and use it with Eclipse we need to install OpenOCD, which provides on-chip programming and debugging support. The best resource here is the OpenOCD README file. Now, to grant the correct USB permissions so that OpenOCD can be run using your user account and not root, copy the UDEV rule 60-openocd.rules to /usr/local/share/openocd/contrib/99-openocd.rules. It creates the group plugdev. You may need to add yourself to this group using usermod -a -G plugdev. For the ST-Nucleo boards the file will be named something like st_nucleo_fx.cfg, for example. When you run the openocd command it starts a service that will communicate with your target using JTAG. The service can be controlled by connecting to it using telnet, for example, or GDB. To connect to the service using telnet type telnet localhost 4444.